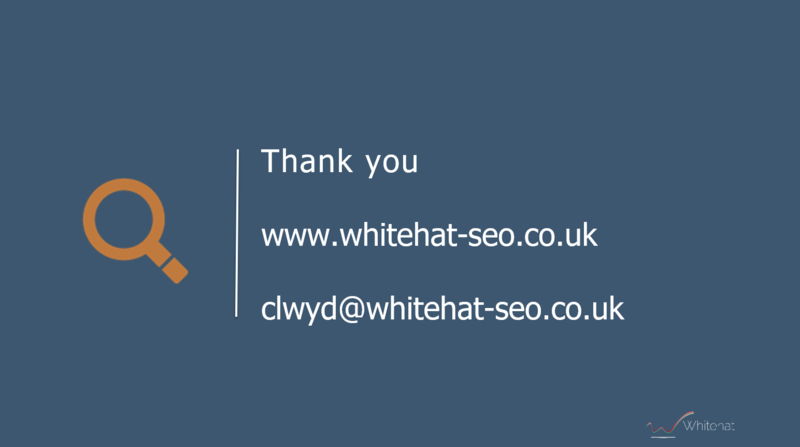 This is a transcript of the talk given by Clwyd Probert from Whitehat at the HubSpot User Group Meeting in June 2018 in London. One of the things that we've done in the past is that we've run several events and we've covered different topics. We put out surveys, we put out questionnaires and we ask people: what kinds of questions, what kind of problems you're having? What do you actually want help with? Search Engine Optimisation/SEO (how do I get found on Google? How do I get seen? How do I get traffic to the site? The inbound methodology starts with awareness and people can't be aware of you until they find you. So Search Engine Optimisation is the cutting edge of the whole inbound methodology. So that's one topic that comes up again and again, I wanted to cover it because it's what we do. I've been doing SEO well before we became HubSpot partners, back in the days of 2005, it's when I actually started helping my first SEO clients. So we're kind of good at that and I wanted to cover some basics. The other thing that gets asked a lot is: how do I actually come up with ideas for really good authority content? Because as marketers, there's so much noise out there, there's so much background noise that it's difficult to rise above that. And I wanted to talk a little bit about that. That leads very well into the other thing that we get asked about so much: video. Because everybody talks about video. It's the prime means of communication. Video content is certainly the biggest amount of traffic that exists across the internet at the moment. So how do you leverage video? Which is why we've got TwentyThree as a partner today talking. "So the idea of the HUG is to inspire and educate". And if you are at the last event, there was probably a balance leaning more towards the inspire rather than the educate. We had a fantastic talk from Ian Redmond and Dan Tyre. I tend to settle more on the tactical side of things, I like practical ideas, things that people can implement and get results from tomorrow. So this is kind of where this is going to go. It's not going to be technical (I'm not going to be talking a lot about metadata and that type of thing), I'm hopefully going to give you something that is relevant to the business, so you don't need to be a coder to understand this, but there are lots of misconceptions about Search Engine Optimization and how it actually works. So I want to go back to some basics and I want to talk a little bit about how it all works. 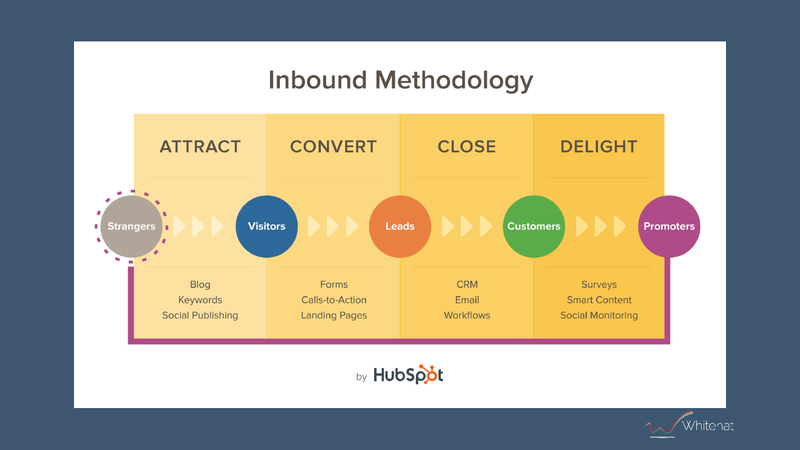 This is the inbound methodology that most of us should be aware of: attract, convert, close, delight. Turning strangers to visitors, visitors into leads, nurturing those leads until they become customers - and in the latest incarnation, managing those customers with the latest HubSpot software -, turn them into promoters and that drives new strangers back to the site. But that first bit is so important: how do you attract. That's horrible! You put all this time and effort, you've paid an author, you've created this fantastic piece of content and it's not coming back. So how does search engine actually work? How do they rank for content? There are 3 elements to it. They have to find the content in the first place. They have to analyze that content, figure out what it's all about. And then they have to rank it, they have to figure out, out of all of the possible results, which one's going to be number one, which one's going to be number two. So you as content creators, you need to build this discovery and relevance and you do that by creating lots of high-quality content, hopefully on the topics that you want to be known for, and you have to build authority around those topics by getting lots of high-quality links back to your website. And that's the key thing that most people actually leave to fate. It's one of the most important things that you can take away from this talk today. So the 3 things are discovery, relevance, and authority. 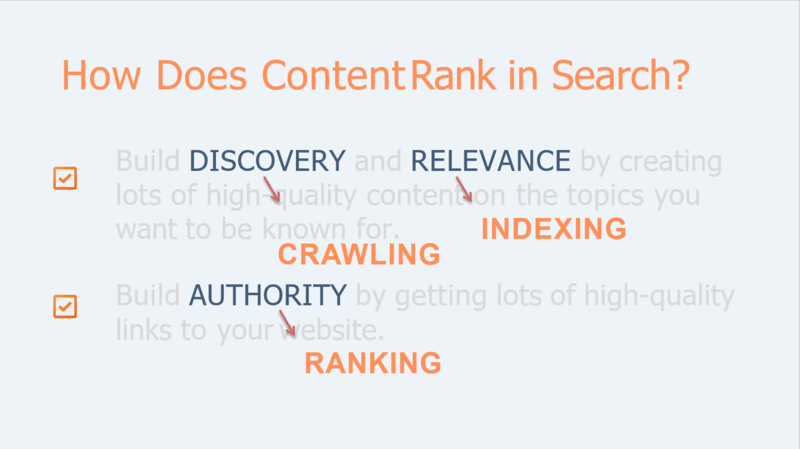 In Google's words, that translates into crawling, indexing and ranking. Google has these things called bots or spiders and all they really do is they hop from web page to web page looking for new web pages, and then you'd make a great big index and that's all those things do. They then pass it onto what's called a relevance engine. And the relevance engine looks at every single page that's been found and tries to figure out what it's about. Now, this is really, really important. "Really the way I look at Search Engine Optimisation today is by looking at it as though a person". We're looking at that page: if it reads well, if it comes over as authoritative, if it's not spammy, if it's not thin content, then it's probably good for Google. The other thing that you really, really shouldn't be doing is you shouldn't be creating content that is not relevant for your business because you think Google might like it (because it's topical because it's trending...). You really need to own your own space. Google is not a person (yet! It's heading in that direction...), but at the moment it's a very intelligent algorithm and you've got to help it as much as you can to understand what it is that you want to be known for. Authority is the hidden secret sauce, if you like. Authority says: "Well, I understand what this page is about. I understand what this website is all about. I get it that you are whatever you are, but why are you better than those other guys who also seemed to be in your space? Why would I put you at number one and then number two as opposed to putting these other people that are number one or number two?" "People publish and pray, they don't promote". Authority directly impacts ranking strength and vice versa. So the metaphor is with a bookshop: you've got a whole pile of books. Where do you put them on the shelves? Do you classify them by author? Do you classify them by subject? That's you your indexing strategy. And then which ones do you actually put on the best seller's list? How do you choose from all of those books? Which one are you going to actually pick up and put in front of the shop that actually are the ones that you're going to push the hardest. So how do you determine authority? Let's comes back to the original Google, the algorithm back in the day. It fundamentally hasn't changed. "There are 600 changes to the Google algorithm every year, but this one really has not changed". And it comes from academia: you know, if you write a scientific paper and these guys came out of Boston, out of MIT. Essentially they came up with the idea that if you had a research paper, how do you know that paper is better than any other research paper? Well, it is because it's cited in other journals and the more citations that you get, the higher quality that piece of content is perceived to be. So if you translate that to a web environment, then those citations translate into links. "If you have a link from another site, it counts as a vote to your webpage, it counts as a vote to your site and therefore your site is going to be better than somebody else who doesn't have those votes". So that was in the early days of SEO, that was in the days when you could actually rank by going to an outsourcing agency and buying a million external links and it was all great. And then you could get your site on number one overnight. It doesn't work like that anymore. But the fundamental idea is still sound: you still need those links. The difference is that the links now are weighted, so the links themselves have to have authority. So if you have a link coming to you from the BBC, it's going to count much more than a link from your cousin's website that was built yesterday. So everything is equal, but some things are more equal than others. How often should you publish something new? Discovery, relevance and authority are dependent on each other, so you need a balance between all of these things. This is the thing that's missing in most campaigns. People tend to think all about content. They tend to think that they have to produce so many blog posts a week and we're all guilty of this: the agencies that are here and Whitehat... This is how we did things back in the day. We would sign a contract with somebody that said: "Well, you know, what we're gonna do is we're going to produce three blog posts for you, maybe for a month. We're going to produce some really good content. We're going to publish it out through social media". And at the end of the month, at the end of the quarter we'll tick off a box and say: "Yeah, we have. We've done that. We've done our job". But that didn't actually change the needle in terms of driving revenue. Then what was the point? "There is no correlation between the frequency of posting and you're ranking. There is no correlation between the frequency of posting and your Google ranking". It doesn't matter if you publish twice a week or twice a day or once a month. That's not going to move the needle. It will if that content is targeted right, both to your persona and to your influences, but the actual frequency itself is not an indicator of ranking and that's a mistake that a lot of people make. Marketers are a really, really guilty of this, not just agencies. They're guilty of being busy, they're guilty of just being busy in writing content: "I produce so many blog posts, I've done all this tweeting, I've done this social media", and they think that's their job. "The job of a marketer is to generate sales qualified leads for the business, to pass those over to the sales teams and the sales team's job is to take those leads and close them". And then to provide feedback back to the marketing department to tell them about the quality of those leads and you get a positive reinforcement loop in place that can actually drive revenue. That's how marketing and sales teams should work together. That's not how the way that most businesses actually work. So the important thing here is these 2 things. 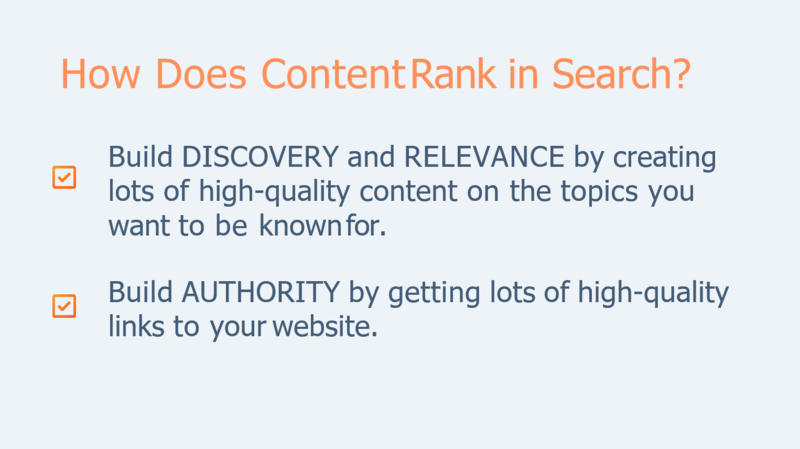 If your content isn't relevant, then it has little chance of ranking no matter how credible it is. 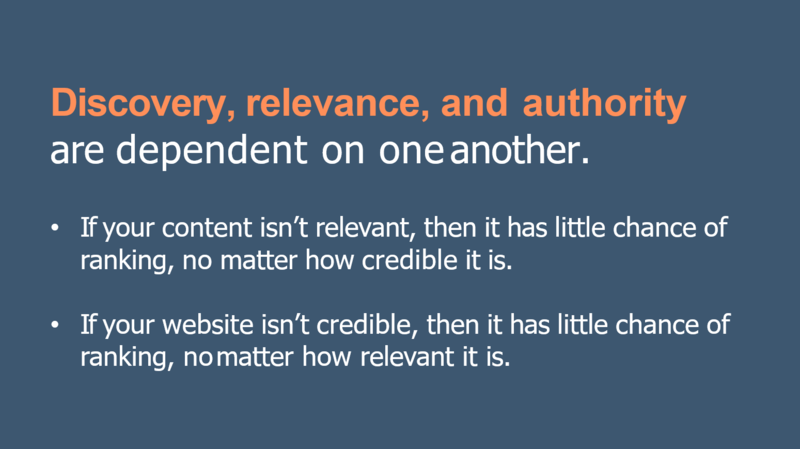 And if your website isn't credible, then it has little chance of ranking, no matter how relevant it is. The average length of a blog post produced today is probably around 400/600 words in length. That's kind of the typical blog post that people are churning out. The average length of a page on the first page of a search ranking is 1500 words. The average length of a page in the first three results from Google is 2500 words. You need to produce long-form content and that content needs to be quality. And I would say it is better to produce one really good long piece of content that it is to produce 5 or 10 shorter pieces. There's a couple of industry experts who talk about this, several people I follow. One is a guy called Brian Dean, who is one of the leading SEO experts. There's many of them out there, but Brian, as somebody I particularly like. One of the reasons I like him is he gives very, very practical advice and if you look at how he has built his site and how he ranks against other SEO companies - because that's what he does -, he doesn't write that much. He's maybe written 30 or 40 blog posts in the last year. And if you compare that to the prolific content of companies like HubSpot and others, it's incredible that he does so well. But if you look at every single blog posts that he produces, it's outstanding. It's something that you would want to share. It's something that you would bookmark it, something that you would remark on - and that's interesting work because it's remarkable content in a very, very specific way. "Remarkable content means something that other people will link to. And when you have something that other people will link to, that creates by definition links, and those links are the things that you want". It doesn't matter if you produce content that is targeted at your buyer personas - it's great for the buyer personas, it's great for your business, absolutely, that's what we do, but your personas don't have authority websites. Your buyer personas are not going to be writing about you on their blog. 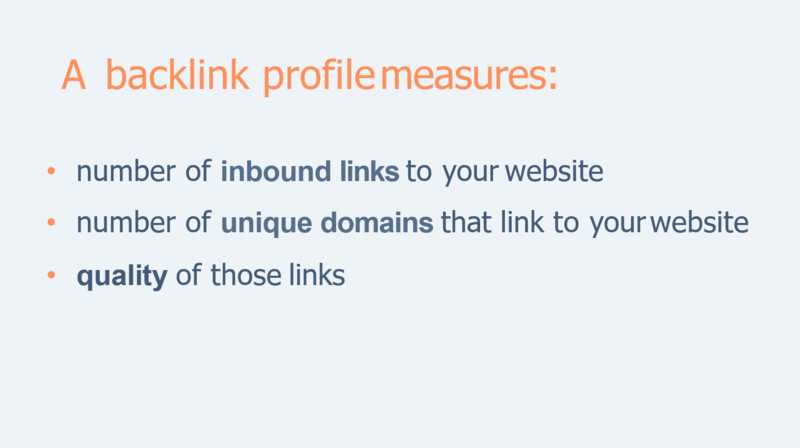 Your buyer personas are not going to be creating links that come back to your website. Some of them might, but they're not authority sites, so you have to think very carefully about the content and the type of content that you produce, and I'm really seriously suggesting that a large portion of that content should be targeted not at your buyer persona. It should be targeted at what we call link influencers (influencer marketing is a common term for it). People who are authorities in your industry, people who blogs about what you do, people who write about what you do, you need to think about them as a persona and you need to target them and you need to create content for them and then you need to outreach to them and get them to share. And that is how you build authority. And then when you've got authority, all that other stuff that you're writing for your personas will suddenly start to rank. That's how you do SEO. These 2 things are really, really important and they're often misunderstood. 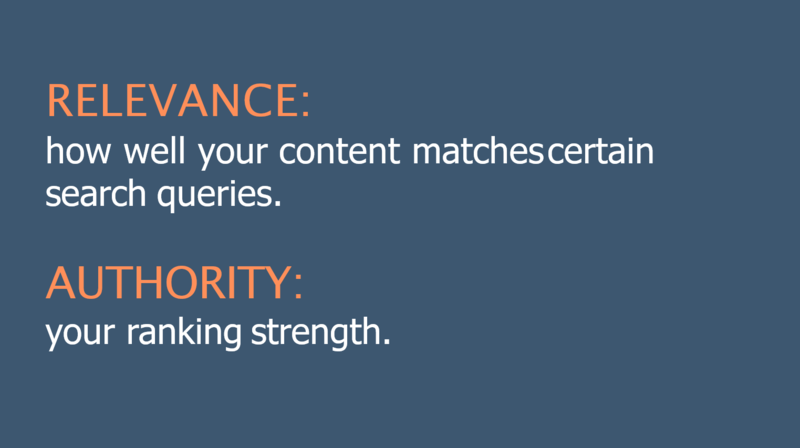 So relevance: how well your content matches certain search queries. Google is very, very good now at understanding searcher intent. And what I mean by that is if you were to search for, I don't know, football clubs in London, right? If you were to type that into Google, I would guess that you would actually get a list of football clubs in London. So you might get Chelsea, you might get Tottenham or you might get whoever. Now, the interesting thing is that if you looked at Chelsea's website, the page that was returned, it probably would not have the phrase "football clubs in London" on that page anywhere: it wouldn't have it in the metatags, it wouldn't have it on the title. So Google is inferring your search, it's trying to figure out what you actually want, not provide you with an exact keyword match. "So you've got to stop thinking about keywords, you got to stop obsessing about keywords and you've got to start thinking about topics and about subjects and you've got to write about them". And this comes back to a HubSpot thing that they changed recently where they modified and they've introduced the strategy tool where you can actually build out these pillar pages. And these pillar pages are all about topics and that's what you should be doing. 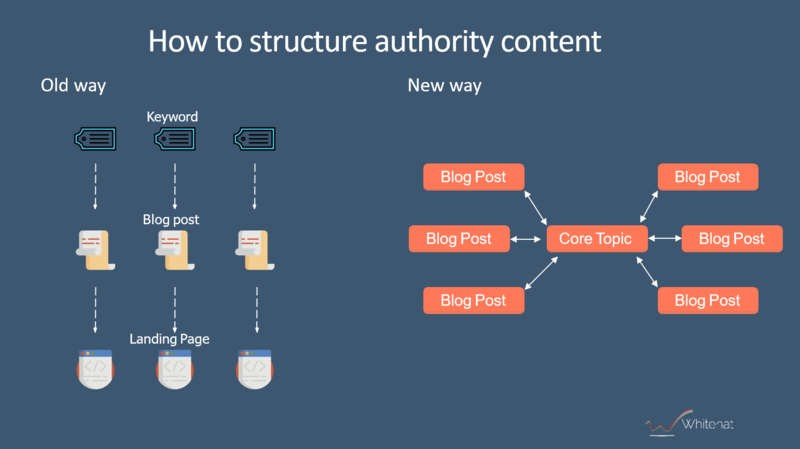 You should be building out these authority pillar pages and then you should be supporting and promoting those pillar pages with individual blog posts. But even if you do that, it's still not going to rank unless you get authority. And that's what I was mentioning before about reaching out to influences in your marketplace. That's how you do SEO. That's how you make all this work. I'm kind of obsessive about this, so if I repeat myself, I do apologise, but create compelling, unique, high-quality content that people naturally want to link to. 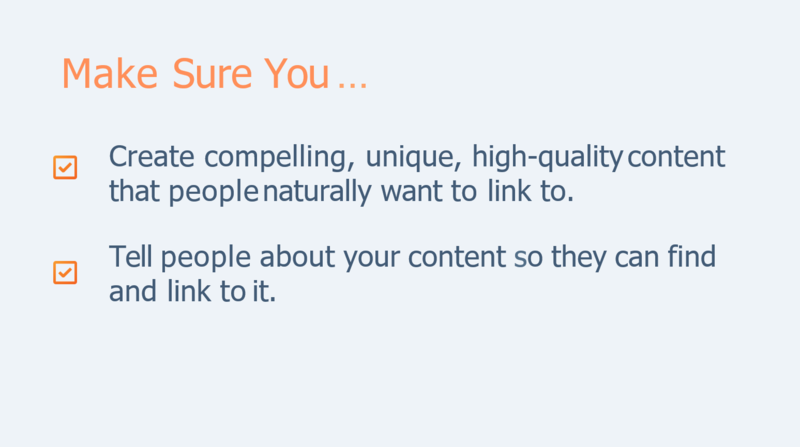 Tell people about your content so that they can find a link to it. And that's the thing that people don't do. your images are SEO friendly, that it all kind of hangs together really well. you put it out through Instagram and that's it. Well done, right? Go home. That is not work done. That is not going home. You have not started to promote. "You need an entire campaign to get people to see that"
Yeah, you could send it out through an email to your email list, but that email list is people that already know you. They're already signed up, hopefully that you know are GDPR compliant and they tick the box, but those are people who already know you. That's not going to be finding new people to add to your list. So how do you do that? You have to reach out, you have to research those influencers in your marketplace, and you have to find ways of influencing the influencers. "Find ways of influencing the influencers"
you can actually phone them up, here's an idea, phone them up, talk to them, say that you're going to be doing a survey, that you're going to be writing a post, ask them what they would like to see. Create content that is remarkable, that is worth remarking on. And then you have this balance between relevance and authority. So relevance is high-quality, we've talked to death about that, everybody talks about that. Building authority is what gives you speed. It will cut your rankings, it'll improve your growth by factors of 10, you can do in months what could potentially take 18 months. So a little bit of small advice here, in terms of your existing organisation. If you're already well established, if your name is well known, if you're talked about, if people are already linking to you, if you've got domain authority, then that's fine. You go back to old school publishing, you create more content. You obviously look at the search engine statistics around keywords and everything else because it will rank because you have the authority. But if you're creating tons of content and you're effectively a startup, if you're trying to break in, then create more focus on building authority as well. Find out who the people are, who are the influences in your space and get them to write about you or at least referenced you. I've mentioned this before: you don't build authority through volume. You build it through high-quality backlinks, but you need the quality content in the first place to get those backlinks. Nobody's going to link back to you just because you've written a 3000-word article which you think is wonderful. It has to be wonderful. It has to be remarkable. This is not something that you can knock out over a weekend. You have to either employ higher quality copywriters, journalist level writers. Here's another idea. One of the most common problems is: how do you create quality content? You know, it's tough. It's really, really difficult, but think about this. Everybody here is working in a company which believes that it knows quite a lot about its own industry in its own business, right? So you, guys, should be the experts in your space. You should know your subject inside and out. Now, one of the things might be that you might not be great writers, so how do you get that knowledge out of people's heads? Knowledge in reasonably large organisations can actually be quite diversely spread. It can be the CEO, it can be the CTO, it could be the head of sales, it could be the support team who have that knowledge, and if you're going to get a sales guy to write a 3000-word blog article, then good luck to you, right? It's not going to happen. Here's a way to do it: you buy him a coffee, you buy him a beer and you sit him down in front of an iPhone and you talked to him, you interviewed him and you put it on video (this is me trying to bring the whole thing back to video). "You put it on video, you get that knowledge out of the people who have it and they will talk. People are happy talking. They're not happy writing". We did a Hug, I'm not sure if many of you were here for the last one where Dan Tyre came over from Boston. He's employee number 6 at HubSpot, I think. He's one of these senior guys, right? So to get Dan to write a blog post for us is nonexistent, it's just not going to happen. But he loves to talk, he loves to travel around the world and inspire. So I gave him 2-hour slots to stand up on this stage and to talk and he gave a fantastically detailed breakdown of how to do inbound sales, how to link the sales and marketing teams together. Slides, presentation, it was wonderful. What do you think we did with that? Yeah, we obviously videoed it, so you've got access to that. You can watch it, you can learn. We transcribed it. We put it through a system called Temi, which will just take that video and turn it into text. It turns it into a pretty crappy text, but it turns it into text, right? It's a starting point. You then give that to a copywriter. They don't have to be a journalist level copywriter, they just have to be reasonably good and they go through it and they turned it into proper English. They illustrated (we took his slide images, we put it into the blog post). We put in proper headings. We put in references whenever he made references. We took out the "ums" and "ahs" that everybody uses when they talk and stand up in front to speak like this. We cleaned up that text. We took out specific quotes. We put in bullet points. We put in illustrations. We spent probably several days cleaning that thing up and turning it into a blog post. 20,000 words is that blog post. 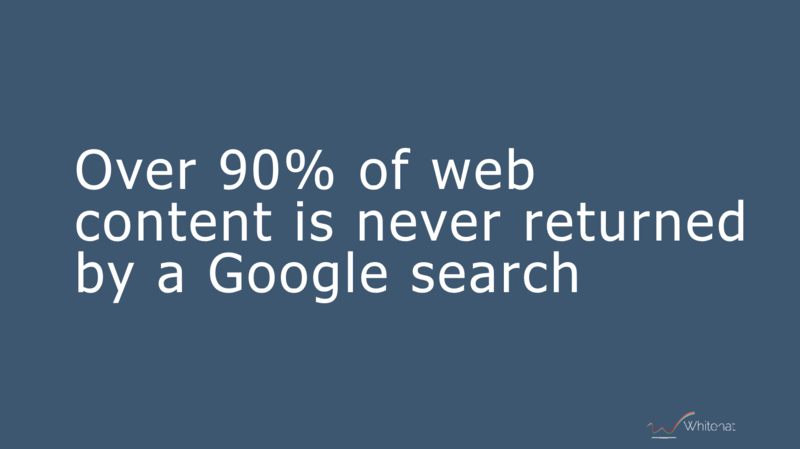 And that for SEO value is huge. You can do the same thing. You don't need to run a conference to do that. You can do it as a Skype interview. You can interview your customers, you can interview experts in your industry. You can interview your own staff and that will give you enough content for an entire year. Obviously, we turned it into a blog post. We gave it to another author who rewrote it and summarized it, turned it into a 1000-1500 words summary. We turned that into a blog post and into an eBook. We put the slides up onto Slideshare. We took the audio, we've put it into a podcast. We're still extracting all of the different social media tweets that we can from 20,000 words. So you think about the volume of content, quality content that you can get from just your own team. You don't need to hire some outsourced copywriter to create content for you. You've got the expertise and you've got the knowledge. The important thing with all of these things and it, and it's a HubSpot obsession as well, is that whatever you do, you need to measure, because you can't improve anything unless you actually keep track of it and you put some metrics around it, so you need to look at the links that you're creating. You need to make sure that your domain authority is increasing and you need to look at the quality of those links. And the way that we do that is that we use external software. 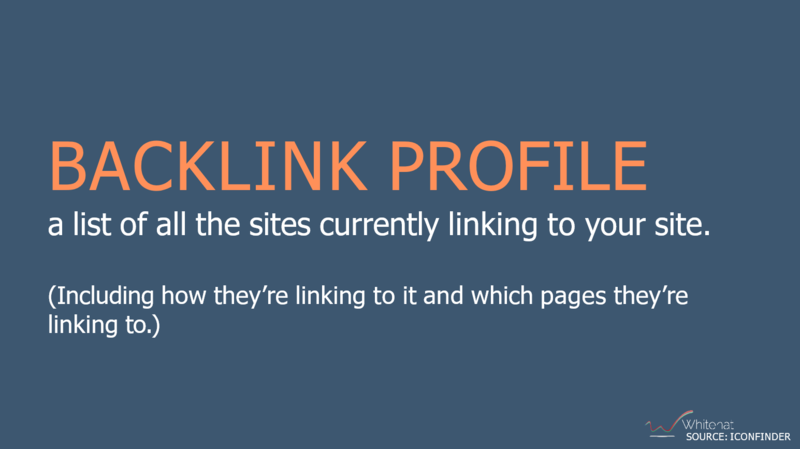 There are multiple different pieces of software that do this for you and you've effectively got what's called a backlink profile. So this is a list of all of the different sites that link to your site and the authority of those sites. So the number of unique domains is really, really important. Although it would be great to get a link from the BBC, if you had 500 links from the BBC and nothing from anybody else, that will be still pretty good, but it would be much better to have a more diverse split. So the number of domains is important as well, and the quality of those sites. So the number of unique domains is really, really important. Although it would be great to get a link from the BBC, if you had 500 links from the BBC and nothing from anybody else, that will be still pretty good, but it would be much better to have a more diverse split. The number of domains is important as well, and the quality of those. 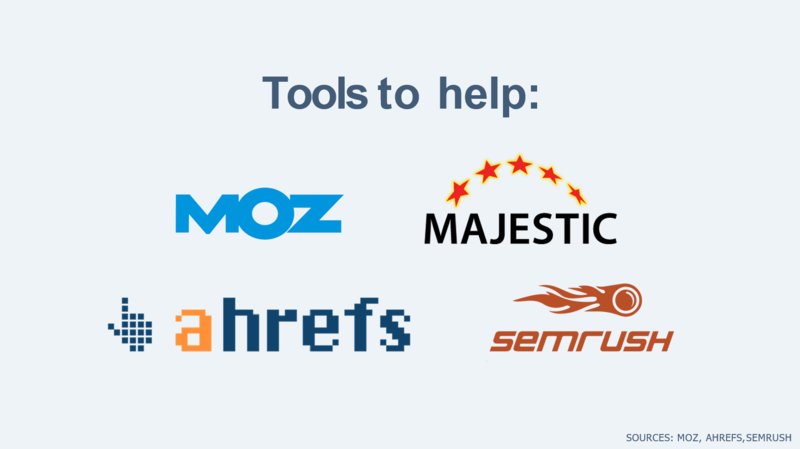 Next, here are some SEO tools. These are the standard ones that everybody sort of uses in the industry. 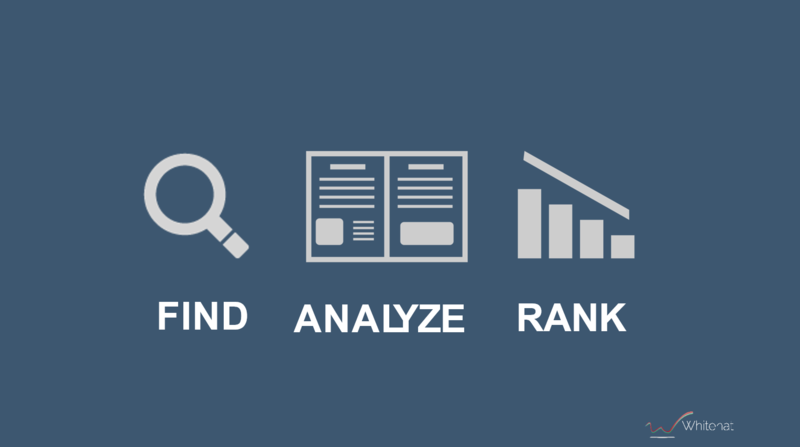 Moz, Majestic, Ahrefs, SEMrush. Moz is really useful because it has a free site tool called Open Site Explorer that you can use. The one that we actually use every days is Ahrefs. I believe Ahrefs has the largest database of company websites of any of them. I think it's second only to Google in the number of sites that it's called. So there's a massive amount of data. If you're a moderate sized company, you need to pay for this stuff and use it. Not sure the exact number, but it's about 700 pounds a year for Ahrefs. But you can get by with some of the free ones initially. We spoke about the buyer persona. This is the standard methodology that you're going to be hearing from HubSpot and on all of the other agencies and ourselves included. You need to be solving problems for your buyers, essentially. I don't need to teach you this hopefully, but the other thing is when you're talking and thinking about Search Engine Optimisation, and this is the mistake that a lot of people make: when they think about keywords, they think about the products and services that they produce and that's where they start. So if I'm a plumber in Croydon, then "plumbing in Croydon" is probably the thing that's on top of my mind, and if you go to an SEO company that's what they'll sell you: they'll sell you a package that is based around the keyword "plumber in Croydon". But your buyer persona goes through different stages of awareness before they actually engage with you and those different stages are going to be deploying different search terms into the Internet and you've got to understand what those terms are. Awareness, consideration and decision. Awareness: they don't even know that they need a plumber yet, maybe there's a damp patch in the ceiling and then they're not quite sure what it is. So they might be googling "damp patch in the ceiling" and you don't rank for that because you rank for "a plumber in Croydon". So you've got to understand your buyers, you've got to understand the different stages that they go through. That gives you a grid, that gives you a metric: the buyer against the different stages. 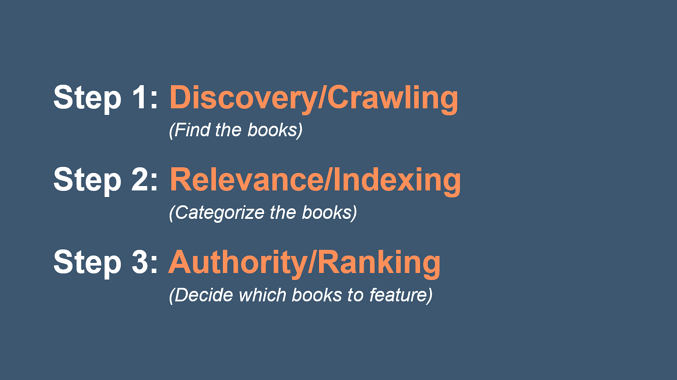 And then you can do your keyword research against each of those things and then you build pillar pages around each of those things. That gives you a content strategy for the whole year. That's what you write about. Once you've done that analysis you end up with something like that. 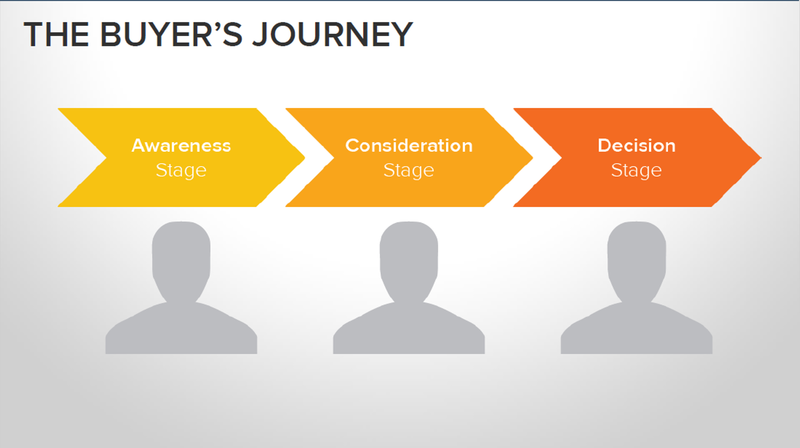 Different keywords for different stages of the buyer's journey. 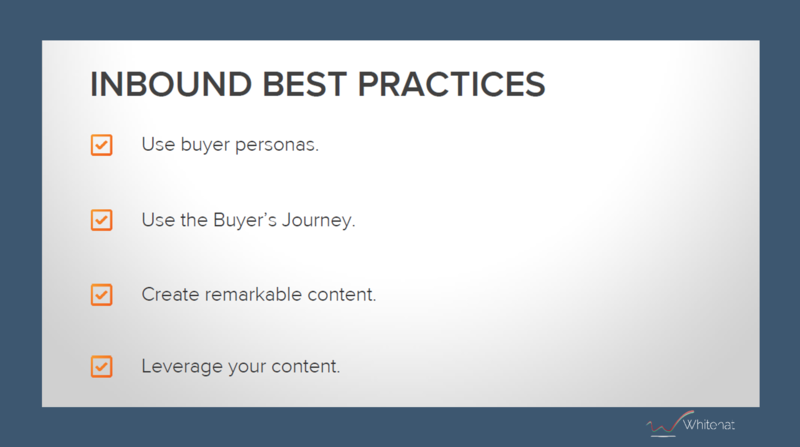 So best practice: use your buyer personas, use the buyer's journey, create remarkable content and leverage the content. Last year HubSpot came out with their strategy tool and it's nice because we've been talking about pillar page content for many years. I mentioned a guy called Brian Dean. He actually coined the term "skyscraper" page and that's a precursor to what is now known as a pillar page. I think the skyscraper is a better phrase because it's long and tall. It gives you the visualisation of a long, massive piece of content that's really an authoritative piece. You did your keyword research, and then for that keyword you would write a blog post and then you'd write another blog post. So to use the plumber example, you'd write a blog post about plumbing in Croydon, and then you'd write another one about Croydon plumbing, and then you'd write another about the best plumber in Croydon. It would be really horrible and that junk just fills up the internet. But that's how you had to do it, because Google itself was focused on individual keywords and you could only really rank one page for one keyword. So you needed lots of pages and they're all more or less the same. It was really not nice for the user. The new world of SEO is around core topics and this is much, much better. It's better for you and it's better for your visitors because what you can do now is you can write one authoritative piece: this is your pillar page, this is your core piece of content, and you write it with all of your knowledge and all of your experience. You put it into that strategy tool in Hubspot and you make it a key part of your website. 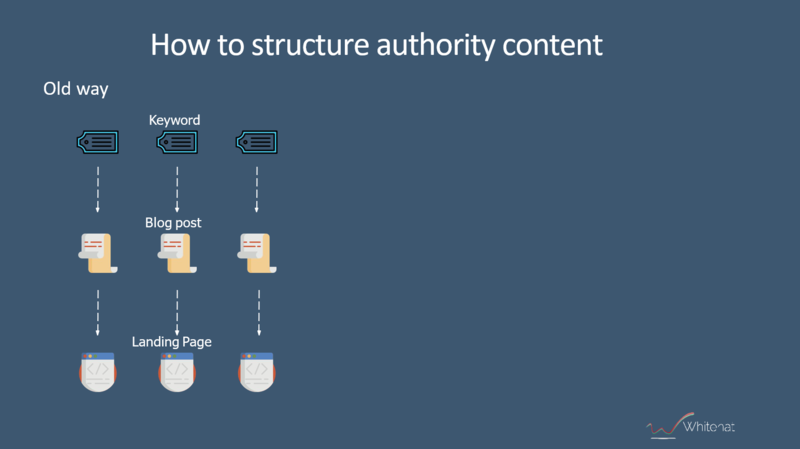 This is important as well: don't make your pillar page or blog post, make it linkable from the home page, make it part of your site structure. "Think of a pillar page as a book, if you like a summary of your thoughts on a particular subject that goes into it in quite an amount of depth, well illustrated, well referenced, something that you would be happy to share with your family and friends and say: "Look, I wrote that"." And then you go further. You take each of those chapters in your book, your pillar page content, and you expand them in blog posts. Then you make links from those blog posts back to that core page and you might link from those core page back to those blog posts: you create this little network thing going on that Google loves and you end up with this like maybe Wikipedia, which says to Google that I know this subject. I know it inside and out, and this proves that I do. So this is how you tell Google that you're an expert in your subject. Now, there's a whole load of stuff around this. I've got a lot of slides which I'm not going to go through right now, but, like I say, what I'd like to do is give you a resource. So I'm going to share this slide deck out, you'll get copies of everything. What I've done for you is we've identified 7 different types of pillar page. If you look at the HubSpot training, if you look at most training actually on this subject, they actually just say: "Create a pillar page". But they don't really give you many ideas about what to put in it and how to structure it, and different ways and different methods of producing pillar pages. 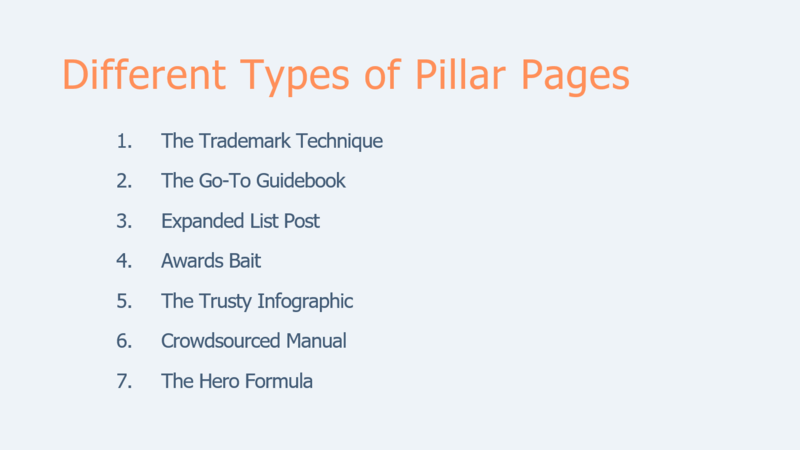 And specifically what I've done here is identified pillar pages that can be useful to be shared with influencers. So I'm going to leave you alone in terms of your buyer persona content - we know a particular technique, when we're using it, we can deploy it in a particular way, we can outreach in a particular way, we've got a way of finding the influencers and researching them. Trademark technique, go-to guidebooks, expanded list posts, awards bait, the trust infographics - you can probably figure out what that one's about -, crowdsource manuals and the hero formula. 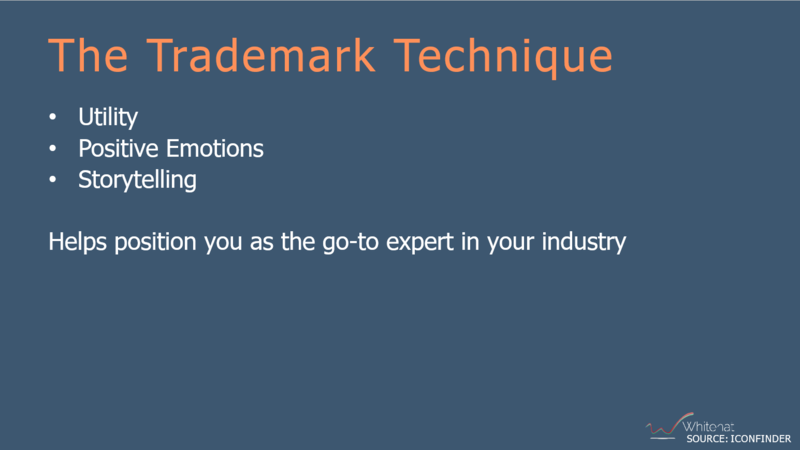 And what I've done in the coming slides is I've gone through one of these, which is what we call the trademark technique, in quite a lot of detail. And the basic idea here is that once you've researched your influencer and you've figured out what's missing or what they might be writing about, you go off and you create content that's really targeted at them with the idea of them publishing it. This gives you a structure of creating some content that they will love and it gives them reasons to publish it. I'll just delve into a couple of these slides and then I'm going to wind up. Research it, you can take an old article that might be 3 or 4 years old. Produce something that is up-to-date and authoritative. And then you can go back to all of those people who've linked to that old article and you can say: "Look, this thing is now the leading authority on the subject that you've been talking about all this time. We've written something that brings it up today. We are now the authority in this space".And they will thank you for it, a lot of them will actually change their old links which are getting strong authority and they'll point to your stuff. Now, the other interesting thing is when people do this, when they asked for these links, they ask for the references, they often say: "Can you put this keyword in the link, can you use my favourite keyword?" Don't do that. All you want is a link. The best link from an authority is actually just your domain name, your brand name. It needs to be non-spammy. It needs to be just natural 100%, because you're not after keyword ranking, you're after authority. They have an authority site and you just want to steal a little bit of it for yourself. 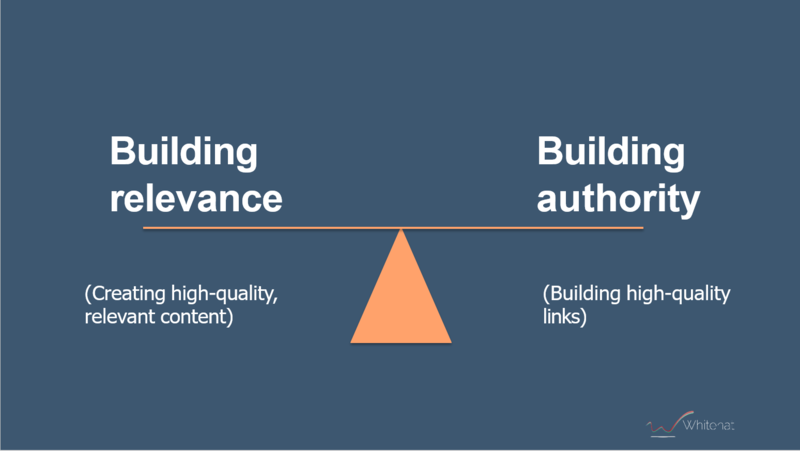 Once you've built up your own authority, you will start ranking for the content that you've created on your site, so your authority is through your link creators and then the actual keywords that you rank for are all those pillar pages and blog posts that you're creating. So I'm actually gonna wind up and stop here. Like I said, there's a whole load of stuff which I'm gonna not talk about, but I will share. You'll manage to capture all of that, I'm sure. Which strategy from this talk are you going to try first? Do you have better ideas or tips that you can share?